In the future economy, the Western countries will loose a portion of their economic influence as the economies of other countries improve, and as democracy expands primarily as a result of enhanced communications. As the graph below shows, it took Britain 155 years to double GDP per capita with about 9 million people in 1870. The US and Germany took between 30 and 60 years to double its GDP per capita with a few tens of million people. India and China are doubling their GDP per capita his at a scale and pace not seen before: 100 times the people than Britain and in one tenth the time. By 2030 in the future economy, Asia will be well on its way to returning to being the world’s powerhouse. By 2030, the majority in most countries will be middle-class, not poor, which has been the condition of most people throughout human history. Higher Interest Rates: Interest payment could go up. There will be more domestic lending and thus higher standards and accountability. There will be more social entitlement payouts and less savings. There is accumulated debt that needs to be paid off. The global currency could change (from U.S. dollars to other)- so the Fed could be less influential and less inclined to adjust the fed rate. Widely Varied GDP Growth Rates: GDP growth of national economies will vary widely. Some countries or regions will grow at rapid speeds. Others will be slow. The differences could lead will lead to global imbalances. NIC wonders if the varying GDP growth rates could exacerbate global economic imbalances. They argue that the global imbalances were a cause of the 2008 crisis. The imbalances could lead to an economic breakdown or increased diversity and resiliency. NIC states that unless there are collaborative economic policy adjustments, future political and economic crises are a real possibility. There is a growing optimism that both the world economy and the banking industry are recovering from the impact of the financial crisis. The financial world is no longer the same and has changed. Banks in the emerging markets are becoming strong. They are better capitalized. They are becoming large enough that they compete with the west in the global markets. They may be better positioned for growth since their focus on their domestic markets and these are the markets that will be growing the most. Will the future financial systems be state-run? What countries will see the greatest GDP growth? Will there be high competition for higher-skilled jobs? Will productivity innovation be important? Reference material - "Global 2030." 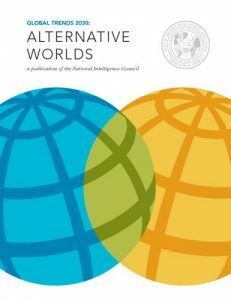 Every four years,the National Intelligence Council (NIC) facilitates the development of a "Global Trends" report. The reports are used by the White House, Intelligence Community, and others for planning purposes. In creating the report, In creating the report, NIC conducts a multitude of conferences, workshops and individual meetings with scholars, experts, universities, think tanks, science labs, businesses and government institutions from around the world in an effort to accurately detect and anticipate future trends.